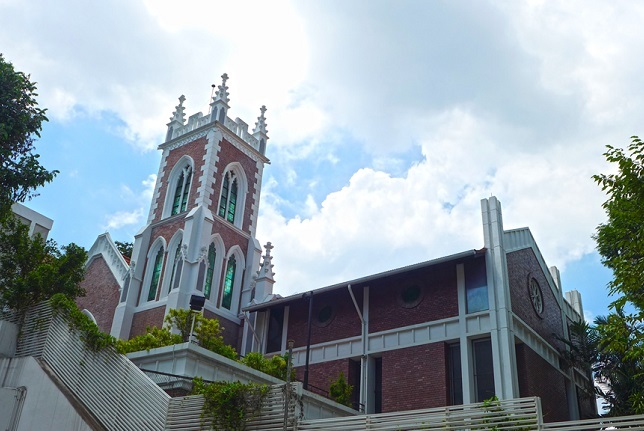 The Wesley Methodist Church is the first Methodist Church established in Singapore by Reverend William Oldham, Reverend Dr and Mrs James Thoburn and Miss Julia Battle in 1885. Early services were conducted at the Town Hall until the establishment of the first Methodist chapel, then known as the English Church, at Coleman Street. The present site was granted to the Methodist Mission in 1907 in gratitude of the education and religious work that the mission undertook. The church building was completed in 1908 and was formally dedicated on 4 February 1909 in the presence of Bishop William Oldham. The church was designed by Mr David McLeod Craik, a municipal engineer, in the late decorated Gothic style. A subsequent renovation in 1912 introduced electric lights and fans in the building.